A calming and gentle wax with added jojoba oil and chamomile to soothe irritated or inflamed skin. Great for therapists or clients with sensitive skin or eczema. Many therapists and clients find that some massage waxes can irritate their skin, especially after prolonged use. Often, this is a result of using waxes made with sweet almond oil and infused arnica oil. Some essential oils can also irritate sensitive skin. While our So Simple wax is made without any of these ingredients and so is perfect for therapists and clients with sensitive skin, we have developed MoogWax so kind for extra soothing and calming of irritated skin. 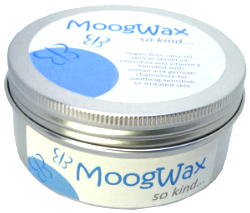 MoogWax so kind is designed specifically to help in the healing process when skin has become inflamed or irritated or where skin is particularly prone to irritation such as in eczema sufferers for example. In this blend, nourishing olive oil and apricot kernel oil are mixed with jojoba which is well known for it’s anti-inflammatory properties. The wax is then delicately scented with a hint of Roman and German chamomile for their calming, healing and anti-inflammatory properties. We used a number of therapists who regularly suffer from eczema to help us develop and test this wax and they were all delighted with the results. This wax is not only good for calming the skin, it also calms the mind, so is great for any clients with anxiety issues too.